Corken Coro-Flo® pumps are a regenerative turbine design. They produce a maximum differential pressure of 150 psig (10.3bar g). Corken manufactures six sizes of Coro-Flo pumps, ranging from 2 to 35 gpm (7.5 - 132 L/min). These pumps can handle discharge pressures up to 400 psig (27.6 bar). These pumps are designed for continuous duty on light liquids such as Anhydrous Ammonia, Propane, Butane, Propylene, Gasoline and others. The DS/DL type Coro-Flo® pumps are designed to eliminate the need for a baseplate, coupling guard, and coupling alignment which makes the DS/DL series pumps compact and easy to install. The special bracket supports both the pump and the motor so they can be directly coupled. The Coro-Flo®'s one moving part, the impeller, floats on the shaft without contacting adjacent surfaces, thus extending pump life. 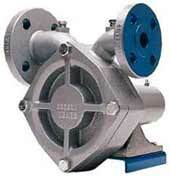 This pump series is inexpensive and simple to repair. The pump design allows the seal to be replaced in minutes.